Our 4th year doing it! 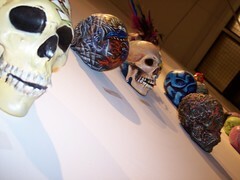 Over 100 skulls designed by some of the best graff and traditional artists, sculptors, and tattoo artists. Werc, Vyal, Jeyd, Jaime Green, Smear, Cache, and many, many, more!! Show runs through December 2, 2007. Check out what the LA Weeklysaid about it! !